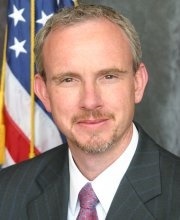 William Brim, Psy.D., is the deputy director of the Center for Deployment Psychology (CDP). He joined the CDP in 2007, initially as a deployment behavioral health psychologist at Malcolm Grow (USAF) Medical Center and has served as the deputy director since 2008. Prior to joining the CDP, Dr. Brim served on active duty as a psychologist in the United States Air Force from 1997 to 2007. Dr. Brim received his Bachelor's degree in psychology from the University of Tennessee and his Master's and Doctorate degrees in clinical psychology from Nova Southeastern University in Fort Lauderdale, Florida. He is a graduate of the Wilford Hall (USAF) Medical Center Psychology Residency Program and the Wilford Hall Clinical Health Psychology Post-Doctoral Fellowship Program. The focus of Dr. Brim's clinical work, supervision and training is on deployment and redeployment related to mental health issues, specifically assessment and treatment of posttraumatic stress disorder and insomnia. Additionally, Dr. Brim focuses on health psychology clinical practice and supervision, the integration of mental health services in primary care and offers forensic psychology expert consultation and witness services.